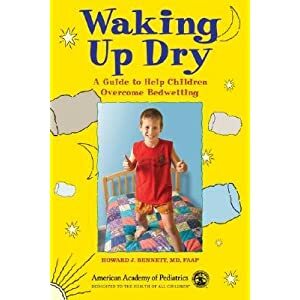 Waking Up Dry « Howard J. Bennett - Pediatrician and Author in Washington, D.C. Written in a child-friendly tone that mirrors a one-on-one conversation with Dr. Bennett, this self-help guide is designed to help children (ages six to thirteen) conquer bedwetting. The book demystifies the problem and shows children that they are not the only ones who are affected. Cartoon characters Bladder Man (a superhero) and Nephron (his 9-year-old friend) put a humorous spin on the subject to help children identify with the subject. Each chapter includes a Q&A section to provide more detailed information for parents.